While I don't do many contests, I've always wanted to try my hand at painting up a Red Scorpion Space Marine. They have a very simple and cool looking color scheme I think. There's just something about grey armour with a single accent color. It always looks so sharp. After finding out that Jack from over at Red's Corps Red Scorpions was holding a small contest to create a Red Scorpion Space Marine character, I figured this was the perfect excuse to try my hand at painting one up. The contest requires you to make up your model's stats and I'm not sure how well I'm going to do with that aspect. But, I like to think my painting turned out well enough. And really, all this is my weak excuse to paint one of these guys up in the first place. The first thing I did was head to my Imperial Armour books to see what I could dig up about these guys so my model fit in with what was already being put out there. I remembered seeing them in IA6 where they made an appearance on Vraks. After looking through the book, I decided that's where I would set my character in terms of history (modeling and painting) and then I'd build the rules from the story I came up with. I still haven't come up with my rules for this guy yet, but I'm not worried, I still have some time left to work that part out. Why just a Veteran Sergeant? I went with this lower profile for a couple reasons. First, I like the idea of senior troops leading Tactical squads. On top of that, the Red Scorpions have a tendency to replace their Sergeants with Apothecaries. It's an upgrade you can buy using the Forge World rules for them. I opted out of the Apothecary upgrade and went for the traditional Sergeant look for this guy. Most of all though, it's what I had spare bits to make. That's what it came down to in the end. I was lucky I had the right kind of helmet to use otherwise I might have passed on this whole project all together. Using Vraks as my stage, I built my Veteran Sergeant to fit the story (and bits) I had available. I went with the classic chainsword and plasma pistol combination. I didn't have the older MK arour chest plate I would have liked to include, so I had to go with a basic one instead. I did use a set of running legs I had lying around to give him some movement like he is charging forward leading his men. 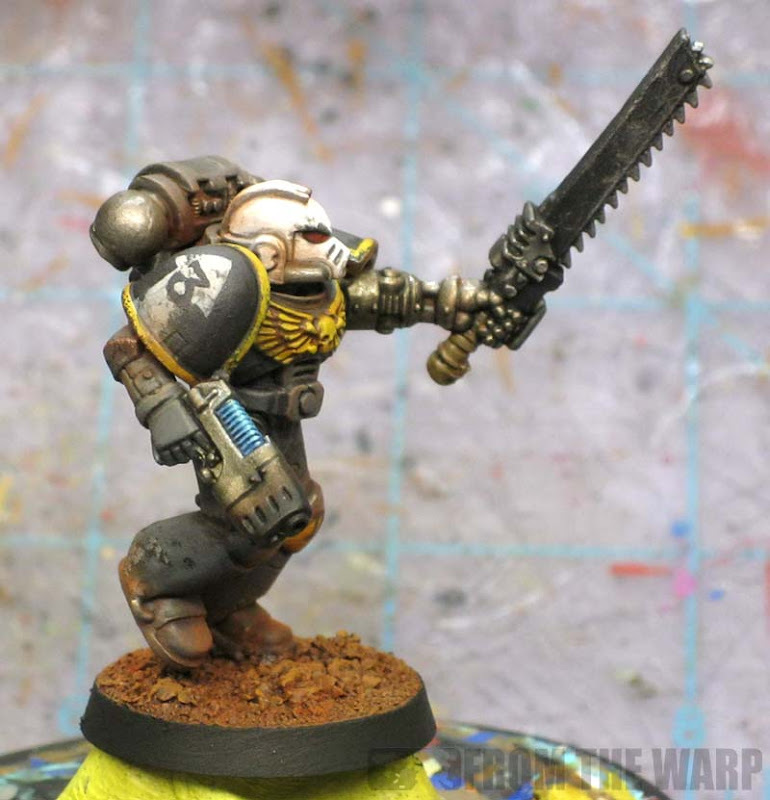 Just like any other chapter with grey armour, there are a hunderd different ways you can go about it. Do you want light or dark, warm or cool looking, strong highlights or subtle and the list goes one. I decided on a slightly darker and muted armour scheme against a high contrast base color. That's fancy talk for I painted him to look like the picture in the Imperial Amrour book and I wanted to use a killer red weathering powder so I needed an excure to do that too. Knowing that his sole purpose was to paint him for fun, I finished him off in a quick evening of painting. I did go all out on the weathering though to give him the gritty look I like. Some chipped paint here and there with weathering powders (from Secret Weapon Miniatures) and he came right to life. Looks quite nice for a quick model. I really want to Ty out some weathering powders and think they'llbe my next larger hobby investment. Dave: I would have thought you'd have already been into them. I find them to be one of the best things I've bought for "painting" in a long time. I love the effects you can get. I will say that like most things, it's probably best to buy good ones instead of cutting corners and getting cheap ones or trying to make your own. Nice one Ron, nice one! He looks great and I have to agree with you in the comment to Dave, I bought some Secret Weapon Weathering pigments and I think they are easily one of the best things I have come across for placing them in their environment (My gaming table/display board). Looking forward to seeing the rest of the entry if you're still thinking of putting him in. I'll be posting peoples entries from the 21st through to the 31st and will put up the voting polls on the 1st. So this is Vraks? Looks more dusty than muddy. Hmmmm. I know you must have that Secret Weapon scenic mud kit, Ron... why not seal this figure with some sealer, and then slap some mud on his boots, maybe a track in the mud on the base? Just a thought. I've wrestled with a Vraks basing theme for my army, and I still don't have my "mud skills" where I'd like them to be... I bet you could pull it off though. Just a thought. Looks great- love the plasma pistol in particular! Red: I need to work on his rules this weekend. Mr. Esty: It's the dry season? deathkorps: Thanks, it's nothing more than one wash over the base color. I just happened to get lucky with the results. I love the simplicity of the piece. There's no big frills, nothing super fancy. It is already one of my favorites from this blog though:) It looks absolutely fantastic. All the colors are just right, there's a good sense of motion, and it looks real. Well done! One thing though. I keep seeing that helmet, but I can't remember where it's from. Any clue for me? Well played, Mr. Saikowski, well played indeed. Flekkzo: Thanks. To be honest, it's how I like to paint models these days. Simple and then ad a detail here and there for effect. It's not often I hit the mark dead on, but I like to think I came real close here. The helmet is an earlier Mk obviously. I don't know which one exactly, but I think it comes on the Black Templar sprue. Mr.Esty: I may try my hand at a real "mud" base and see what I can do with one. I might have something lying around that I can use. I think that is mark 4 helmet, the pinnacle of power armor development! This is such a great model Ron. Hope you paint a red scorpions army. I would love to see a whole force painted this well! They are cool looking. Every time I find a super cool color scheme, I'm tempted to try them as a new army. Do it! I'd love to see you work on an army of them. I've no doubt you'd put me to shame but it would be great to see your take on the Red Scorpions. Red: I may try a squad of them, but a whole army is another thing all together. How do you make the foot of the model look so amazing? Seriously the dirt looks so real. You did a fantastic job. you make me kinda wanna start red scorpions. great job. Melad: Thanks, after painting him, I wanted to do up a whole squad to see how they would come out. The feet and lower portion are covered in weathering powders. If you look in the FTW archives under the Painting section, you can find the few articles I've done about powders. They give a great, realistic effect to your models with just a little bit of work. 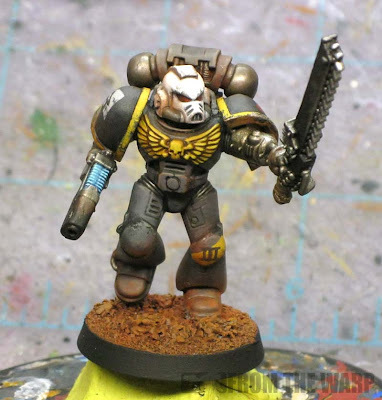 Please can you put the colours that you used to paint your sergeant, as I would like to paint my own but am not sure how. Anon: Yikes, I didn't write down the exact colors I used for this guy. I think the grey could be done with GW Astronomican Grey these days. The yellow is the old GW Foundation yellow... I think it's Iyaden Darksun maybe over a dark brown basecoat. THe helmet is white layered over a very light grey color left showing in the recessed areas. Shading could be done with GW Nuln Oil and Agrax Earthshade. The weathering is done to taste depending on what environment you have him in. 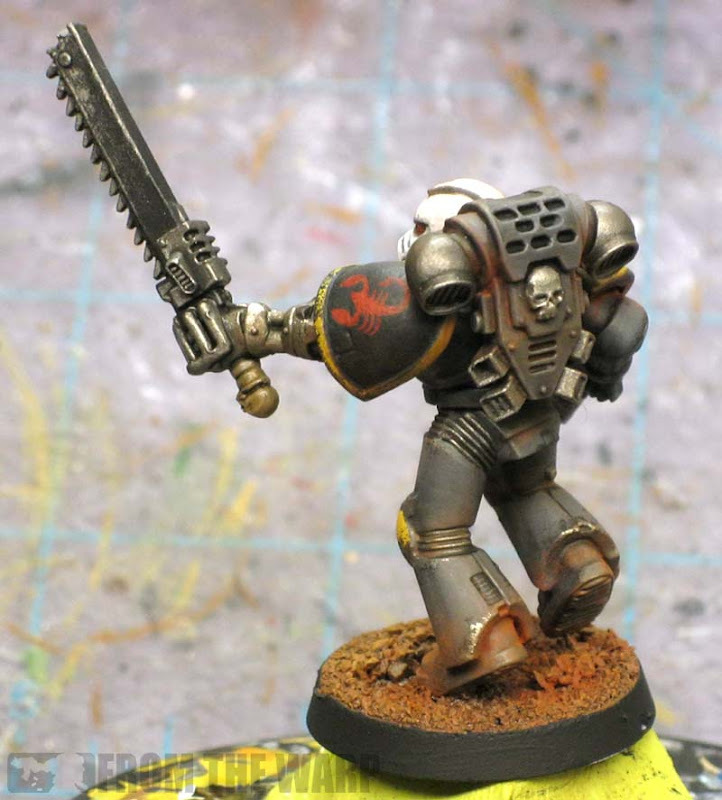 Change the Astronomican Grey to Mechanicus Standard Grey. The first one is way too light.